I thought I'd introduce you to my new online friend, Anita Schytte, who is the Tine K Home sales and brand manager in Denmark. She lives in the port town of Korsør which is not far from Odense so she's close to the sea and lots of lush, green forests. Anita also write articles about interior decorating for Danish financial newspaper Borsen in their Friday magazine about glamorous villas, castles and manor houses. She also speaks Danish, English, Hungarian and German! It really is true about Europeans, most over here do speak several languages fluently. Yes, it's intimidating as I'm still learning German! I love her white Tine K Home lamp. 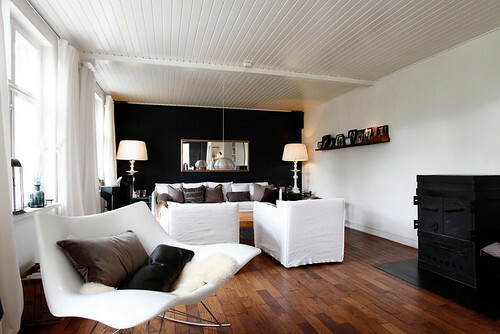 I like the sofas, chairs, pillows and lighting in her living room, don't you? 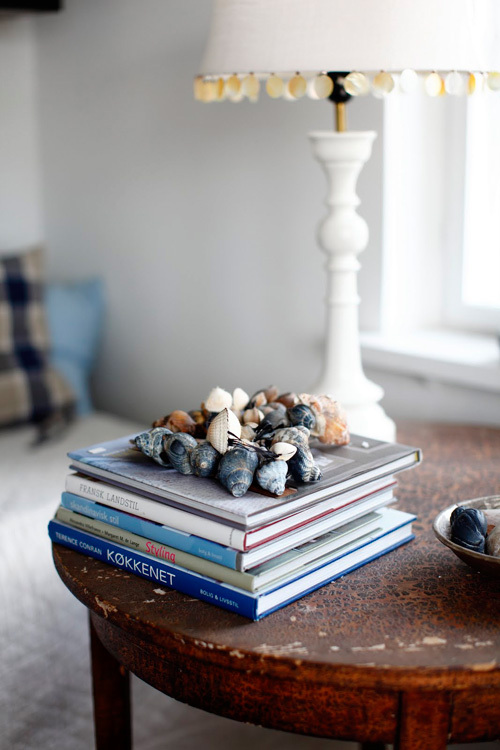 They're all from Danish brand Tine K Home and I find them just so lovely! I want two of those chairs for my own living room and the lamps too! I have to put in an order soon, I have a bit of a procrastination problem at the moment I think! 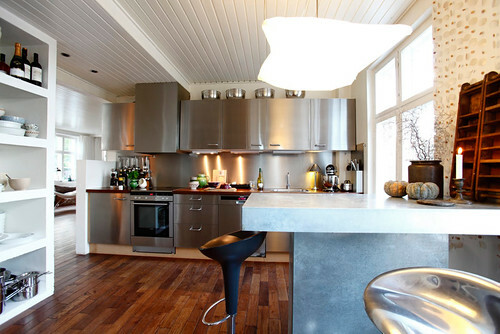 I love the shelving in her kitchen to the right and those huge windows. What a nice spot for cooking. If you look over to the left you can see her living room so you can see that it's very accessible to the living space. Okay that dog is too sweet, right? Look at that cutie on the Fatboy with the bone motif on the side. My goodness, what a show stealer that little dog is. 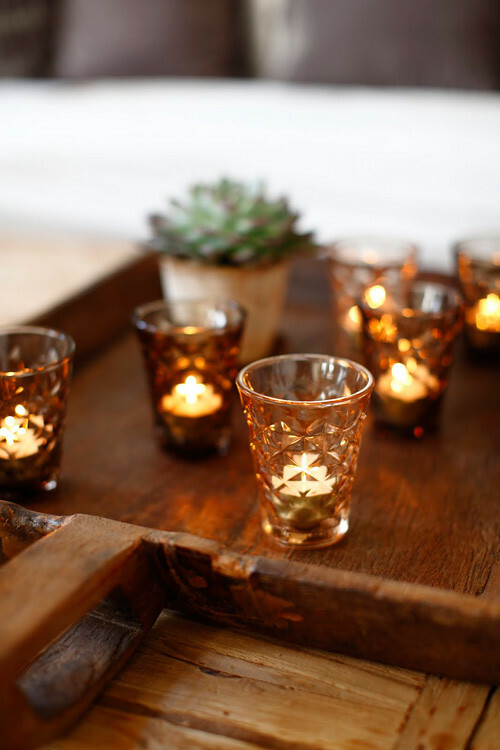 Gorgeous Tine K Home glasses also work nicely as tea light candle holders. I love that table to the right of her sofa in green. I have this mild obsession for Thai furniture at the moment painted in fun colors like turquoise but I also love certain pieces in lacquered white or striking black. 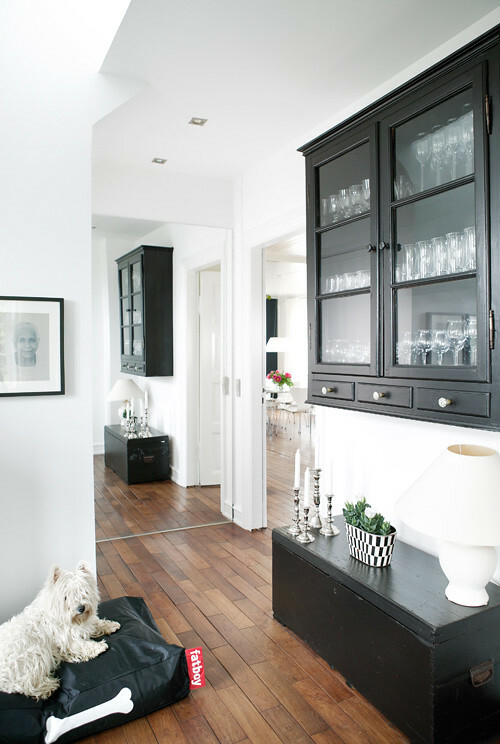 I've actually been into it since I saw a few pieces in Tine's house last year when I was visiting her to style her home. She had a lovely low bookcase that I couldn't take my eyes off of in white and to this day, I've been unable to find anything like it. 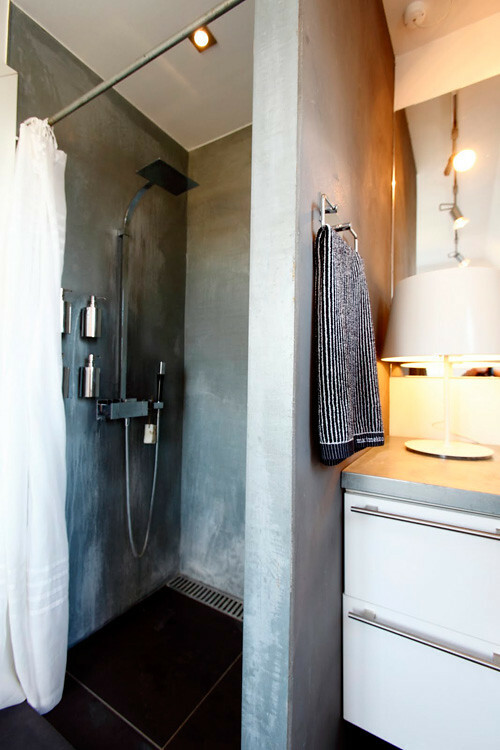 This bathroom is so modern and lovely, it reminds me of bathroom styles in Germany that are very common. 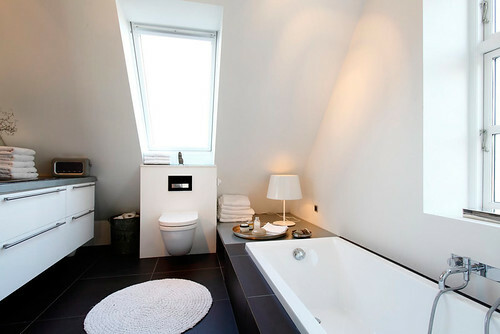 Clean, modern, high end gorgeous bathrooms Love the skylight and that deep tub. Imagine taking a bath there by candlelight in the evening as you sip champagne and look at the stars? Oh yes. Here's another angle of the gorgeous master bathroom. I love the shower stall - it's perfect. I dream of having a shower stall completely free of of tile - just a stone shower. That would suit me very well - I love how natural and simple it is. I thought I'd ask Anita a few quick questions about her home to wrap up because seeing photos isn't always enough for me, I like to know a little bit more about the person who occupies the space - their passions, favorites, inspirations... So let's learn a little about Anita. What do you love about living in Denmark? Both of my parents came from Hungary back in the 50's and found their new home in Denmark. It is close to their homeland and I'm close to all other European countries which are just around the corner. I have always felt home no matter where I am, and I could quite easily move, except that my family and all my beloved friends would not move along... so the best part of living here is my relationships with so many dear people! I also live next to the sea and the forest and enjoy the northern light from all windows in my house. What do you love about your home? The size - I love the space and all the possibilities! I get to live out my crazy decorating ideas (I'm an interiors freak!) day and night and my house is constantly evolving. What makes a house a home? Collections of personal things - constantly changing things around and welcoming new possibilities within the borders of money of course! Also to have your kids tell you never, never even think of moving anywhere else - then you have the right place, that is what makes a house a home so I think I stay where I am. What do you like to do the most at home? On Sundays I'm constantly walking along the kitchen table - all day long - making and serving everything from roasts to baked goods. All day I'm cooking, baking, blending, mixing and lining all of the ingredients up in beautiful bowls. After having cleaned and redecorated my house that is - I cannot relax and enjoy a Sunday meal until housework and decorating is finished! What inspires the way that you decorate? I have a long time passion for design, preferably Northern style such as Arne Jacobsen and Poul Kjærholm but I mix many designers and periods with eclectic accessories in my home. One day I'm interested in pink acrylic and another, loads of natural materials - or soft dark velvets. Then perhaps I'm interested in Tricia Guild and lots of color... I could go on and on because I have no particular references as I consider myself to be quite open. 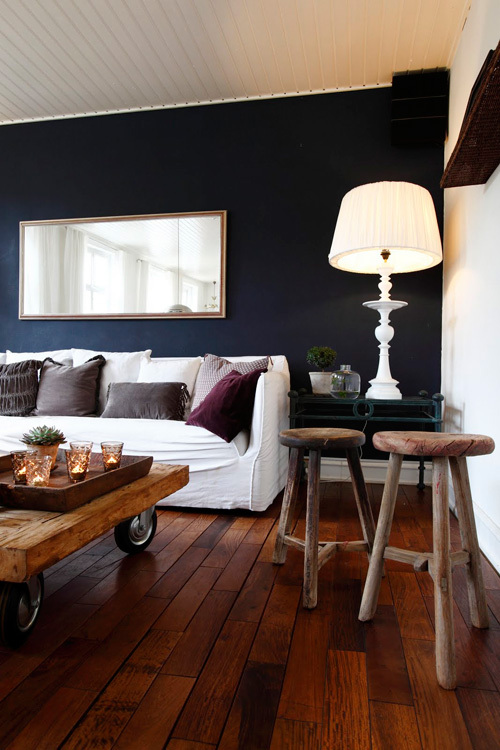 Right now I am dreaming of Dutch style and chalky matte paint on walls (I wish I had an old manor house to paint!). 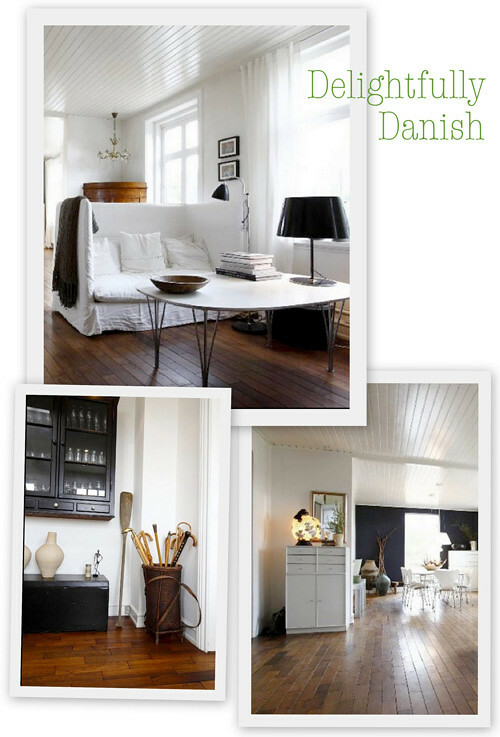 What are your favorite Danish interiors blogs? Danes have no tradition of blogging - like the way the rest of Europe does. What is one dream item for your home on your wish list? I would love to have an old big greish cabinet in my dining room to contain my plates, dishes and all of my favorite glassware. 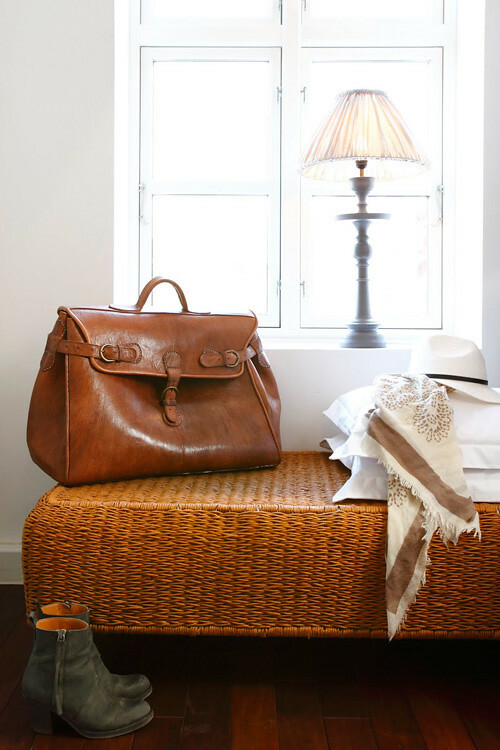 What is your favorite thing in your home and why? I love the design of my Thomas Pedersen Sting Ray chair. That will never leave the house - but also the lamps of Danish designer Birgit Østergaard that look like pillows (you can see them in the kitchen). Also my XL TineKHome lamp is an absolute favorite and the table made of old Balinese teak wood (from a hut) to the because it looks like a tremendous piece of driftwood and I love to pile all my interior design books on top of it.